Literally WordPress core search engine is of very basic type and it may turn many of your website visitors off while they search content inside your website. Apart this, there is no facility to create custom criteria search with different search parameters. Custom criteria search is almost a crucial thing for websites that offer various kind of stuff, such as listing websites, ecommerce websites or a large multi-niche portals. Many themes have been floating around with integrated advanced search but their advanced search is of no use when it comes to using them outside these themes. Here we want to explore the ways with the help of them you can create your own custom search with as many custom search parameters as you want and you can search either default post type or any custom post type content. By means of this post we are going to introduce you with reliable plugins with the help of which you can create multi-criteria advanced search. WP Views is the best way to add a custom content search to your WordPress content. The special attraction of this plugin is that it works for any content type and 3rd party create custom fields. Unlike Formidable Pro advanced search, it can filter posts, custom posts that are already created in WordPress. It can filter custom posts, taxonomies, custom fields and whatever regarding your WordPress content without any limitation. 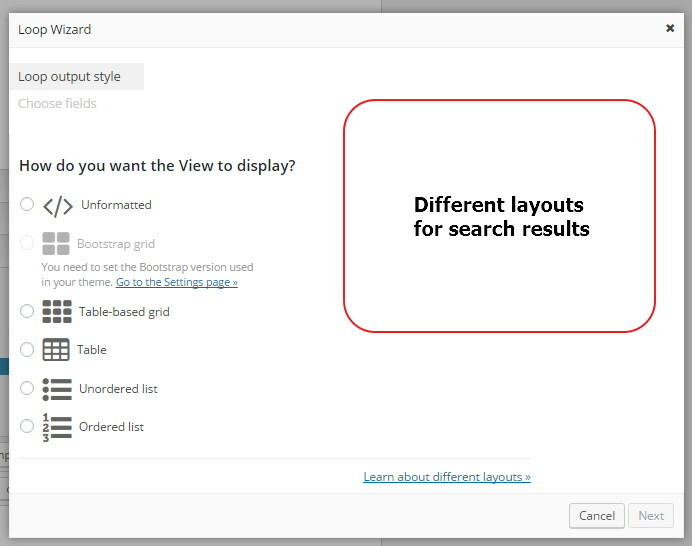 With the help of WP Views, you can create custom search result layout and display search result in a way you like. You can also ajaxified search result and search result will display automatically on changing any value in advanced search. WP Views is a part of the Toolset but can work independently. 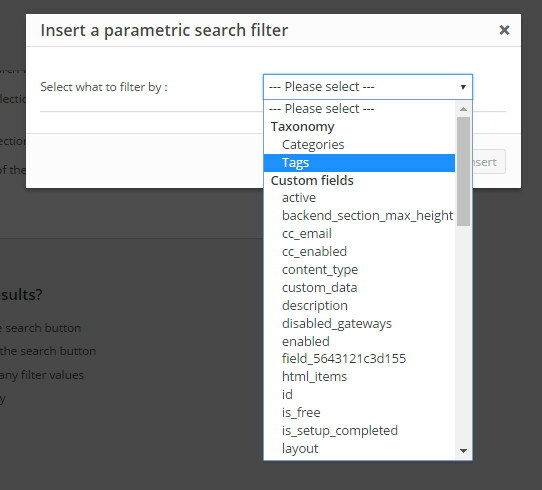 All you need to do is creating a new View and select option Parametric Search in View settings. Then create Search Filters using step by step wizard. Customize your search result display according to your needs. 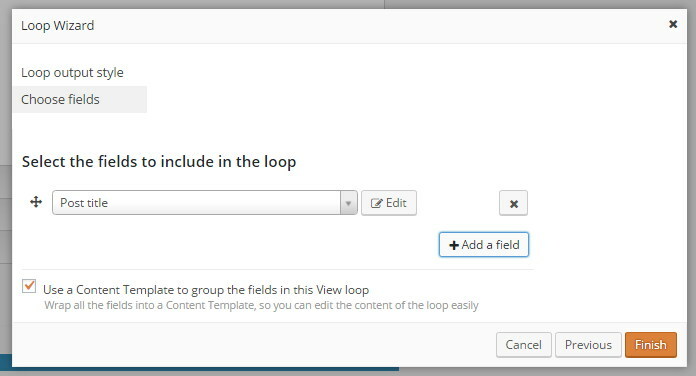 Go to any WordPress page and add the created View in the post using View button in post editor. 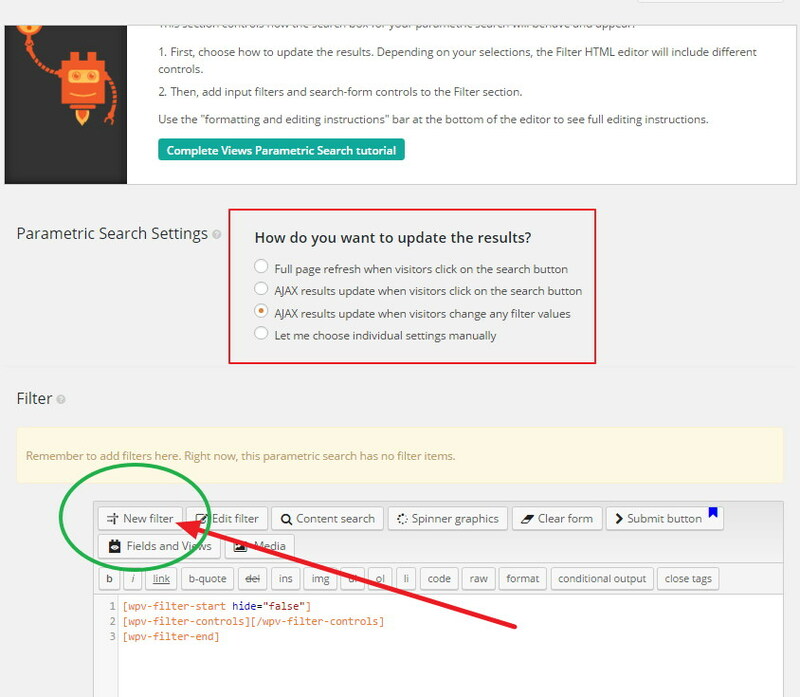 As we already told in our previous post what can be done with the help of Formidable Pro in addition to form building, we can create an advanced search with as many filters as we want. However, You will need to go through their documentation to make a multi-criteria search and use it. With the help of Formidable Pro we can create directory listing website such as Real Estate, Auto mobile, people and city directory and much more and get its advanced search to filter data with custom criteria. Actually Formidable Pro advanced search crawls the only data submitted as entries (either from backend or frontend). Thus if you have a post type set up with Formidable Pro, every submitted form will create a post and it will be searchable via advanced search. But if you add a post direct from WordPress “add new post option”, it will not be added in Formidable Pro database and will not be searchable. So if you think to use its advanced search for your existing posts (not created with Formidable Pro form) that will not work. 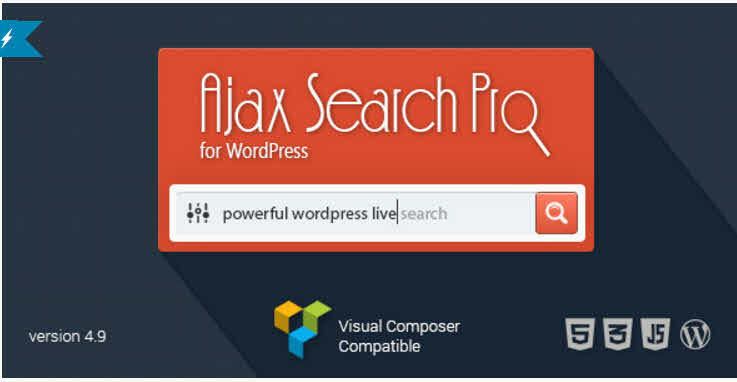 The most sizzling feature of Ajax Search Pro is its intelligent search relevancy. If someone types wrong keyword or misspelled keyword, search box show inline suggestions like Google. It makes a huge sense and helps readers find right content for them. It is in your hand whether you want to enable Ajax autocomplete or want to disable it. To be very clear, nobody will want to disable its beautiful Ajax autocomplete feature that makes it truly stand out. Ajax action appears very quick and it displays result inline less then in a second and thus, without leaving the page you can see search results. Also you can set the total number of search results to be shown in dropdown box. Many times users do typos and thus default search engine is failed to find what they exactly want. Only Ajax Search Pro makes it possible. When the entered keyword is not found in website database, inline keyword suggestions are appeared. There is no need to load search result page again and again. Choose your desired search result from dropdown displayed via Ajax. You can set result layout horizontally or vertically. Show search result with thumbnail grid, thumbnail slider or in polaroid mode. 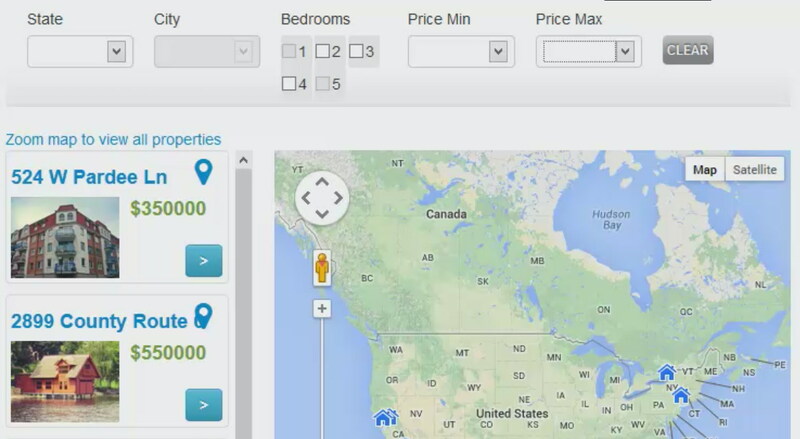 Ajax Pro has an option to add custom fields in search and you can also add price slider. 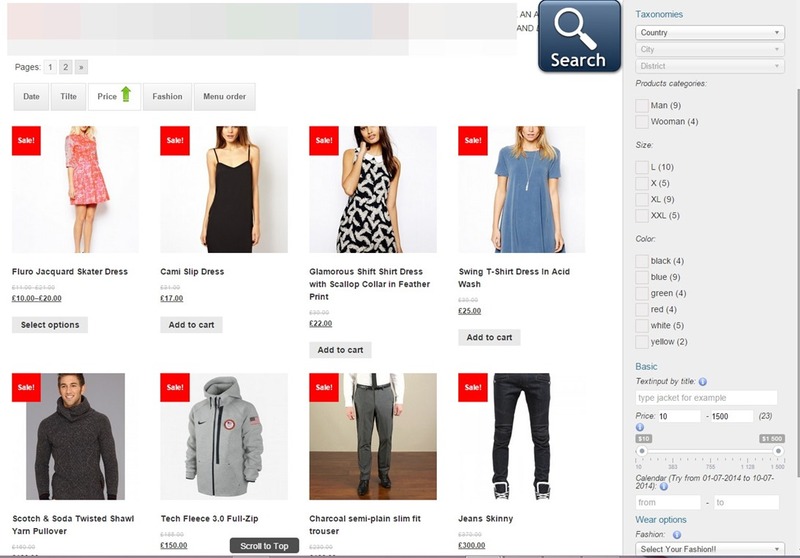 Thus you can create an advanced WooCommerce product search adding product custom fields, categories and price slider. It is fully up to you how much importance you want to give any particular part of a post such as post title, content, excerpt, custom fields etc. We were unable to outline any flaw in this plugin. Yet, we just have one thing to say for you that on account of availing a number of available customization options you may waste your time remarkably. Please make a note – biggest setback of using this plugin is that it can't filter custom fields added by WordPress core or any other plugin. So, if you disable the plugin in near future, all your effort will be lost. WMDTF is a plugin that lets you build custom content filters. With the help of this plugin you can create search fields of several kinds such as Dropdown, Checkbox, Price or any other value slider and custom text input. It creates an automatic Ajax grid alongside with search widget and whenever you make any change in the search widget, Ajax works and updates the grid content automatically. Furthermore Essential Grid integration augments its grid filtering with versatile and beautiful grid creation facilities in Essential Grid. 1.Though MDTF is the most powerful advanced search builder plugin but on the other hand it needs advanced customization to make it work. You need to have a close look on provided documentation and videos in addition to getting in touch with plugin support. In simple words it is not a plugin that provides custom search feature out of the box.